Sandymount House an integral part of the deVesci Estate is a beautifully restored 1836 period residence set in tranquil and mature woodlands and has great charm and elegance. It is a country house bed and breakfast and boasts individually designed bedrooms all ensuite. With its sweeping staircase, marble fireplaces, the balance of old and new is carried throughout. Contemporary furnishings combined with original features afford our guests an impressive area of comfort and peace. This owner run house was restored in the past two years and there are attractive lawns front and sides resplendent with quality features such as a stream, mature gardens and a magnificent monkey puzzle. Sandymount House is set amidst the charm and relaxed lifestyle of Co. Laois, full of welcome, the craic and healthy relaxation which will provide you with unforgettable memories. From heritage sites, scenic country villages, walks, golf, equestrian trekking, cruising, lake and game fishing for the discerning guest, for those in need of "retail therapy" there is an abundance of shops within 30 minutes. 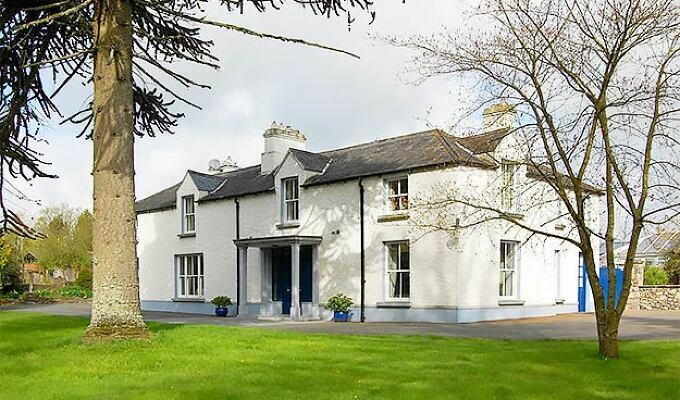 Sandymount House is 2 km to the heritage town of Abbeyleix and is very close to historical sites and country walks. There are several racecourses within reasonable distance which include the Curragh and Punchestown. Other close attractions include Heywood Gardens, Emo Count, The Rock of Dunarneise, The National Stud and Japanese Gardens. The owners of Sandymount Robin & Avril are dedicated to providing for your every need. They are delighted to assist in mapping out itineraries, reserving tee times and arranging local fishing trips and horse riding. Advice for local shopping trips both locally and surrounding counties. They will provide a dedicated and enthusiastic service for their guests and extend a warm welcome to all. Guests can enjoy open fires in the guest lounge or TV room. All bedrooms are equipped with TV and have computer access.